2) the life sciences and health care industry. One of the problems that today’s warehouses have to deal with is the issue of off-site storage. There are many reasons that warehouses have to utilize external storage facilities. While not optimal for the normal course of operations in the supply chain, they do offer a less expensive and temporary alternative that allows a business to deal with temporary spikes in demand. All too often this so called “temporary” storage solution has a way of morphing into a semi-permanent adjunct to the main warehouse. No matter the reason, the fact remains that many businesses do have to deal with this reality. There are a host of challenges that this situation presents, including the need to manage FIFO effectively, minimizing travel and transportation costs, planning replenishment, and accounting for this inventory in your scheduling and lead-time calculation processes. One of the primary challenges we are seeking to address is the ability to maintain accurate inventory by having the ability to perform cycle counts. Most often these off-site storage facilities are managed by a third-party provider who has their own logistics system. Other times there is no wireless coverage available. The second use-case we have seen is in the life-sciences and healthcare industry where medical device manufacturers maintain consigned inventory with various hospitals and with their own sales people. Again, it is not possible to log on to your own network and effectively perform transactions. We have tried in the past to do this through cell-phone networks. 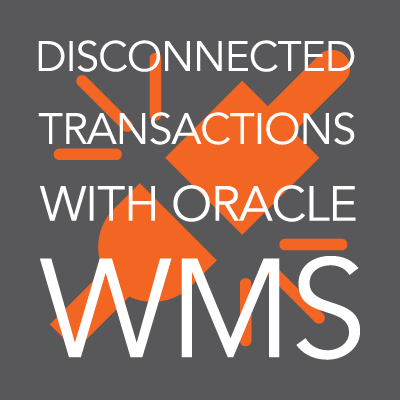 Although the technology exists, it has been our experience that the speeds and capabilities needed to perform such transactions are not yet where they need to be.Therefore, at Gaea, we decided to create an offline counting application that allows customers to schedule counts through Oracle WMS as they normally would, download them to their device of choice, and then be able to perform cycle counts at remote locations. Once they are no longer in their proprietary network, the app detects that it is no longer able to establish a connection with the host ERP and transitions to an offline mode. It then allows them to perform the cycle count of their choice (note that multiple cycle counts could be downloaded). The app then simply syncs back up once they are back in the home network. Alternatively, the counts can be emailed for uploading into the host system. We built this to run on pretty much any device that supports a browser, including iPhones, iPads, Android-based tablets and smartphones, and on Windows-based rugged devices. The goal was to build an app that allows you to do what you need to get done in the simplest and most unobtrusive way possible while addressing an obvious pain point for a lot of clients. This entry was posted in Articles, Blog and tagged Oracle Mobile Supply Chain Applications, Oracle MSCA, Oracle Warehouse Management, Oracle WMS, Supply Chain. Bookmark the permalink.